Chef Key leads a cooking workshop at the Poughkeepsie Underwear Factory. “So creative, I never thought of putting apples and sweet potatoes in the same dish!” An inspired smile spreads across the face of the woman taste testing. I can feel the excitement too, it bubbles up as I stir a pot full of finely chopped roots and fruit, seasoned with cinnamon and sea salt. There is definitely a warm, loving family energy happening on the black top of the basketball court at Malcolm X Park today. Children are dancing to the DJ’s kid-friendly hip hop, and adults from Scenic Hudson and a local mosque are leading a group on a exploration at the banks of the Fallkill Creek that flows alongside a shaded, grassy hill. MASS Design Group is also present, collecting community input about plans for accessible creekside parks. That was the scene from last fall’s “Fall in the Park” where I offered a community cooking demonstration that was funded through NYS Department of Environmental Conservations’ Office of Environmental Justice Community Impact Grant. At the heart of environmental justice is the difficult work of ensuring that all voices are included in the making of policies for a healthier environment, particularly those from the most vulnerable communities, low income and people of color, who are disproportionately burdened with the impacts of industrial pollution and contamination. Our goals for the Community Impact Grant are to encourage city residents’ connection to nature, support existing community gardens and school gardens in ecological growing practices and cooking of local produce, as well as to increase the organic matter found in Poughkeepsie’s gardens. The pursuit of meeting these goals has been such an incredible learning and relationship-building process. We began with Advanced Composting Workshops offered in partnership with Cornell Cooperative Extension of Dutchess County and Nubian Directions II, Inc. Local youth, PFP education staff and interns, as well as a handful of community gardeners took part. We came together before the 2018 growing season to learn the science of soil, and to do real-time soil testing. The workshops were several hours in length, and very intensive. We found that it was not the right fit for the young people taking part. Another moment of learning occurred when I tried to lead a cooking class at the Community Family Development Center on Mill St for families of the children who go there for childcare, and no one showed up. Several CFD staff members, the custodian and I chatted while gnawing on some carrots. Had they encountered this issue before, I asked. Yes was the resounding answer, and as we talked much of our conversation reminded me of the similar struggles I have listened to Poughkeepsie public school teachers name about parent engagement. It was clear: in order to do a better job of connecting city residents to the opportunities that the Community Impact Grant was supporting us to offer, we needed to be much more flexible and responsive. So I, along with Jamie Levato, the Educator Direction, began to brainstorm. How could we reach people with already limited time and energy resources where they already are rather than asking them to stretch to make additional commitments? Chef Key offers tastes of healthy dishes prepared with produce available at the Free Farm Stand. Chef Key leads teens in preparing some zucchini fritters. So we shifted focus off hours of content and focused on getting connected to folks where they are living, playing, or already have to go to get basic needs met. Cooking classes at Interfaith Towers senior housing were an absolute hit! Following the popular “Week in Meals” workshop which focused on making fresh foods last and making a delicious Thai Noodle Bowl, I returned in November for “Healthy Holidays” where 26 seniors enjoyed company and conversation while chopping and braising brussel sprouts, parsnip, and carrots to serve with Maple Soy Glazed Turkey Breast. We also started to do cooking demonstrations at events at local parks, housing projects, and schools. This partnership model of community engagement has led to successes like the Malcolm X Park day I described earlier, as well as our attendance at the Boys and Girls Club of Poughkeepsie Day for Kids, a playful outdoor event focusing on health and wellness which reached over 60 children living in the adjacent public housing on Smith Street. At the Morse School’s Thanksgiving celebration, where the entire community of teachers, firefighters, police officers and community leaders come together to feed hundreds of students and their families, I was invited into the school’s cafeteria to prepare fresh Kale and Apple Salad to pass from table to table. Finally, an ongoing relationship has also evolved with the Dutchess Outreach Free Farm Stand. This free distribution of fresh produce takes place the 3rd Friday of every month. I began tabling each event during the early summer last year and have become a regular fixture at almost every distribution since. Nyhisha Gibbs, Dutchess Outreach Volunteer Administrator always manages to welcome me with a quick hug before she returns to directing the group of about 20 or more volunteers who help create the no-cost pop-up market. Long lines of more than a hundred people form well before the 2:30pm start time. Parents with strollers, seniors with rolling metal carts, and young siblings giggling together all wind their way along the parking lot at North Hamilton and Mill St, adjacent to the Family Partnership Center or, in cool weather months, stretch down the block from the Poughkeepsie Trolley Barn. There’s different produce each Free Farm Stand, so each session I create a new, creative dish to offer based on the available veggies. Greek Cucumber and Tomato Salad; Stir Fry of Snow Peas, Broccoli and Carrots; and Spinach Pasta Primavera were some of the dishes sampled by people while they waited in line for food. 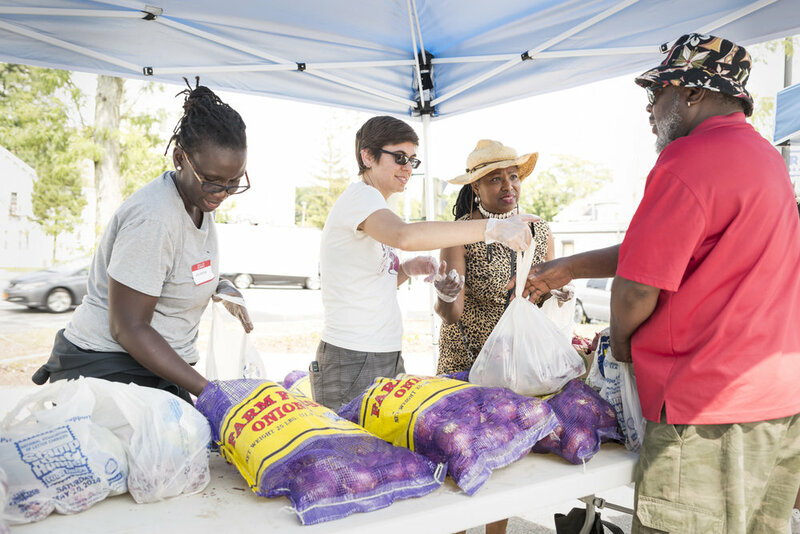 The Free Farm Stand radically transforms the experience of visiting a food pantry into a bustling, warm neighborhood gathering, and PFP fits right in. What a joy to fill the air with the smell of sauteing onions and chat about experimenting with familiar foods in new ways! Teen interns get their peers excited about kale salad at Dutchess Outreach's Mobile Fresh Market. 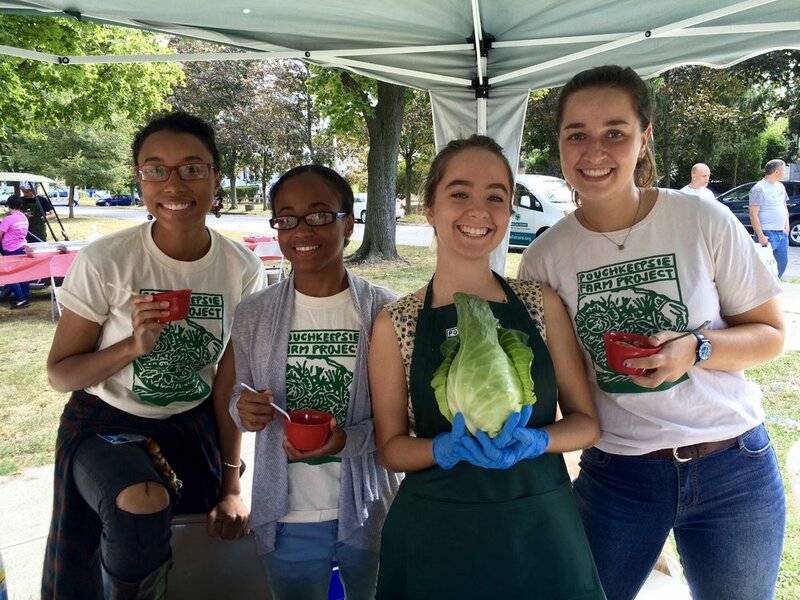 PFP interns, Alyssa, Kitana, Zoe and Olivia offer tastes of fresh curdito at the Poughkeepsie Healthy Black and Latinx Coalition's Hispanic Heritage Festival. With the weather warming up, I’m packing up more PFP produce for spring cooking workshops being held at Adriance Library, Family Services, Early Learning Center and Poughkeepsie Underwear Factory. Along with the team of educators staffing our afterschool programs in all 4 elementary schools, plus the middle and high schools, the DEC EJ grant will allow us to make permanent material updates to school gardens, improving their capacity as educational spaces. While environmental justice issues are a part of the many challenges Poughkeepsie residents face along with economic injustice and complex systemic social problems, these experiences have taught me that it can be a powerful and fun experience to cooperatively create a healthier, more just Poughkeepsie. Chef Key and Chef Dave lead cooking workshops for teens at Poughkeepsie High School. Newer PostGrowers Row: Hey André! Hey Plant Sale!